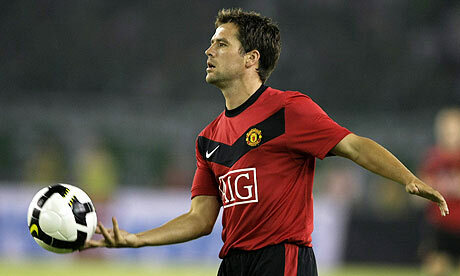 Ryan Giggs believes Michael Owen provides Manchester United with the kind of out-and-out striker they have not had since Ruud van Nistelrooy left for Real Madrid and is confident the former Newcastle United player will improve the balance and potency of the team’s attack. Although Giggs acknowledges that the real tests for Owen are yet to come, he is encouraged by the four goals the forward scored in as many games during United’s tour of east Asia. This week’s Audi Cup in Munich, in which United face Boca Juniors and either Bayern Munich or Milan, should give a fairer indication of how one of Sir Alex Ferguson’s most unexpected signings will begin the campaign. Only in Seoul – the one game in which he did not find the net – did Owen encounter serious opposition. Nevertheless, Giggs is convinced the 29-year-old can improve United’s attack. “I don’t think there was any real scepticism among the players about his arrival. The manager explained that he provides something we haven’t got,” said Giggs. “Kiko [Federico Macheda] is probably the most like Michael in the sense that he is an out-and-out goalscorer but he is still very young. Wayne and Dimitar Berbatov do things outside the box. Should Owen start the season in this kind of form, even the cold-eyed Fabio Capello, who began his reign as England manager sceptical about a man who has scored 40 times at international level, might just bring him back. Owen has not played since Capello’s last defeat – a 1–0 friendly reverse against France in March 2008 – but is still prepared to back himself to overcome Sir Bobby Charlton’s tally of 49 goals. and now the legend talks of owen. i believe in fergie’s decision. and with giggs words.. what else can a fan say?? next season seems very interesting. i think im going to like this new team. there won’t be single star show anymore. manchester united will come back as a team. article from Guardian.co.uk.